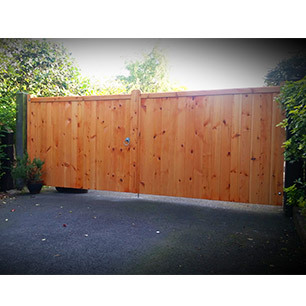 We understand choosing quality driveway gates is a very important decision, so we have a wide range of shapes and styles to suit all properties and their needs. Here at BK Timber we pride ourselves on using PEFC and FSC certified timber. It is very important to us that we support the safeguarding of the world’s forests by using sustainable timber. 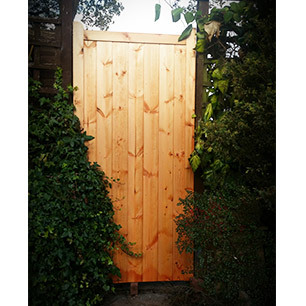 Our bespoke wooden gates are produced from the highest of quality Scandinavian, slow grown, joinery graded redwood timber using a traditional stubbed mortise and tenon joint . Attention to detail is crucial and all our driveway gates are planed down in stages to create a completely smooth finish. We use a spirit based wood preservative, offering two shades, Brown and Red Cedar. Alternatively we do offer a clear preservative which would look untreated. Please see our measuring guide for more hints and tips on how to measure your gap and for post recommendations. We offer two sizes of hooks and bands fixing kits for the driveway gates. We would recommend the 24” hooks and bands for a gate size up to 10ft (3050mm) wide OR 30” hooks and bands for a gate size of up to 12ft (3660mm) wide.Our range of driveway gates in Stoke on Trent, are also available for the rest of Staffordshire, Cheshire, Birmingham and Manchester.